This rare map was found in the Trent University archives, Peterborough, Ontario, Canada. It shows the state lands reserved for granting to the Florida canal company in yellow and the lands of its affiliated land company, the Boston & Florida Atlantic Coast Land Company, in blue. Each square block represents a “section” or one square mile of land. The larger squares represent townships, comprised of 36 sections or 36 square miles. 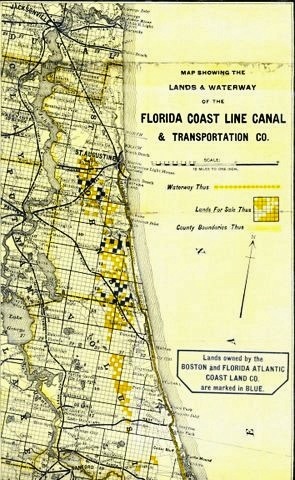 Several of the investors in the canal company organized the Boston & Florida land company to buy 100,000 acres of the Florida canal company at a dollar an acre. Sir Sandford Fleming, chief engineer of the Canadian Pacific Railway soon became the land company’s largest stockholder. The participation of Canadian investors in Florida as early as 1892 has been a little known fact in Florida history. This map was so large that Trent University could not scan it as one continuous document. Hence, it had to be broken up and scanned in three separate sections. Is there enough interest in seeing the middle and southern east coast of Florida ca. 1892? Courtesy, Trent University, Peterborough, Ontario, Canada.